Amazon requires that the products you sell on its marketplace have a GTIN (Global Trade Item Number). However, if you sell products through Printful, they won't have a GTIN. So you have to request exemption from Amazon. Enter that you're requesting exemption for branded products, because you sell private label products. Select that you do have a brand support letter. Upload your brand support letter and wait! After you submit your request, you'll have to wait a few days for Amazon to review. They'll send you an email once it's been approved. 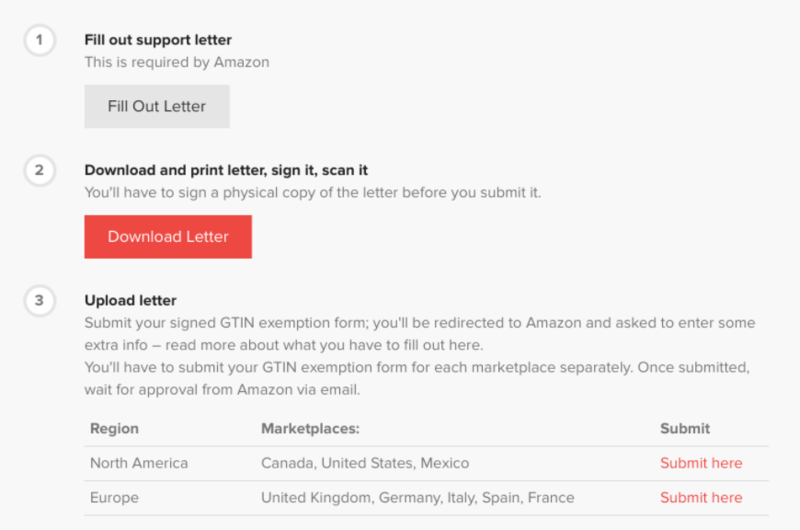 Go to your Printful Dashboard → Stores → Click "Edit" on your Amazon store → GTIN Exemption. Then follow the steps to submit a new GTIN exemption request.